This origami valentine box & card is my second project for Craft Project Central this month. I just loved how this box turned out! The body of the box is made by folding a square piece of card stock. The tutorial is very detailed and easy to follow. You'll definitely want to buy the January edition for this tutorial! $10 buys you 10 tutorials. This project and my crocodile valentine box posted on the 1st are in this edition along with 8 other wonderful projects. You don't want to miss out on this edition! What great projects. I love how you added the top and bottom to the origami box. TFS. I am so glad I have the January edition! I can't wait to make this cut box. You are amazing!! I love your projects and would love to win a subscription. I just found your blog a few days ago and I will be such subscribing soon. Your posts have inspired me to try punch art and I'm having so much fun with it! Would love to learn more! Your projects are so great. I'd love to win the subscription and make these. Thanks. I would love to win a subscription, thank you very much. The project you created is just stunning. It looks complicated, but knowing you - your tutorial will be easy to follow. I do so enjoy seeing your creations. I've made many of your projects from your "paid for" tutorials and that is how I know they're easy to follow. Thank You for giving everyone a chance to win the blog candy - I really do appreciate the chance to win. Keep Healthy and Happy Creating! Thanks so much for your daily inspiration! LOVE this Valentine box! Awesome projects! Would love a subscription! Thanks for the chance. These are absolutely beautiful. I would so love a chance to win the month of January tutorials. Your work is so amazing! Love everything you do. Thanks. I'm enjoying everyday's inspirations. My list of "To Do" keeps getting longer.....TFS!!! This box and card are so cute and pretty, just love them. Very pretty 'tines day pack. 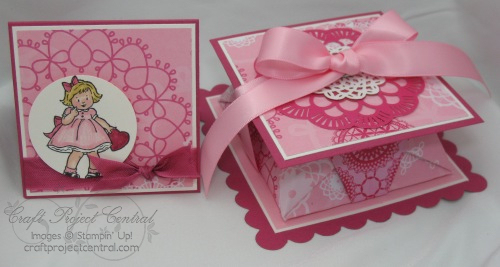 Love all of that pink, and the little box is fabulous! Thanks so much for sharing! Thank you, Kim, for a chance to win at Craft Project Central. I love all your punches and ideas! Thank you also for sharing with us your talent. Great projects & I would love to win the subscription!!!! The projects we have seen so far all look great- thanks for the chance to win! I would love to win a subscription. You all do some good work. I love boxes and cute container type projects. Thanks for the chance to win. This little box is so pretty. I would love a chance to check out Craft Project Central. Kim you are the 'Queen of Punch'! Everything you create makes me a "Princess Creator'! love the box, so beautiful your idea's are so inspirational to me to get me motivated!thanks Kim. What gorgeous projects! I love the colors. Would love to find out how to do these! Thanks for the chance! So cute! Love that stamp set. Love your blog, so many wonderful projects. Have just reeived my second order of PK stamps and am hooked on them! My wish list is huge. Love the daily inspirations, the only problem is I have so many projects I want to do and so little spare time in which to do them. What a gorgeous box - and the crocodile is amazing!!! Thank you for the opportunity to win a whole months tutorials - that would make my month!! I love your blog. I check it almost everyday. I would love to win a subscription to CPC. Thanks! What a gorgeous box..hope i am not too late to enter as i would love to win a subscription, especially if there are punch art projects involved.. Thank you Kim for all that you do. I love that I get an email everyday to show me what people area doing out there in Punch land. I love your project for Craft Central it's really cute. Very cute box. Your creative talent is astounding!! Kim, your blog is a bright spot in my day. Thanks for all you do. It looks like my comment didn't take, so I'm re-commenting (is that even a word?) The origami box is just adorable! I can't tell you how much I look forward to visiting you every day and seeing all the creativity. It's so inspirational! THANK YOU for sharing, and also for offering a chance to win a free subscription to the January edition of Craft Project Central. What a beautiful project! I love the colors! Wishing you a happy weekend! Thank you for all the creations you share with us! Thanks Kim for sharing such inspiring projects each day. I really enjoy being able to see ideas that you and the team have come up with. The box above is just adorable and I am looking forward to attempting it soon.